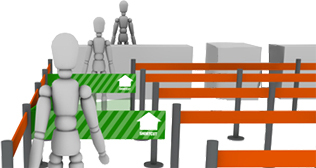 ShortCutQ solves the well known frustration experienced by all who have had to zigzag their way through large empty queue control barriers. It provides a direct route through the system straight up to the point of service. Not only will your customers get there faster, they will also thank you for saving them lots of needless walking. 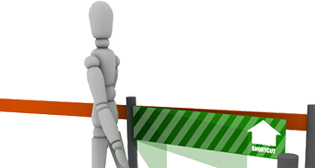 If you incorporate ShortCutQs into your queue barriers systems, not only will your company be better off, your customers will love you for it. 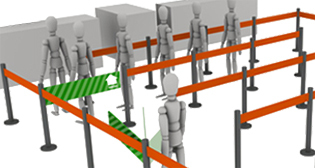 ShortCutQ increases safety by also providing a direct route out of the queue barrier maze in case of an emergency evacuation. The reverse of the gates will provide necessary escape route information to guide people to safety. The ShortCutQs are completely user operable. This means that they require absolutely no monitoring or constant adapting to the length of the queue. This frees up staff to fulfil other vital roles. 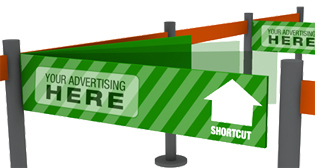 ShortCutQ also offers fantastic advertising opportunities by combining a unique user friendly experience, with direct up-close advertising space that the customer actually interacts with in a positive feel good way.